Want to wrap you flatscreen in a sonic shroud? 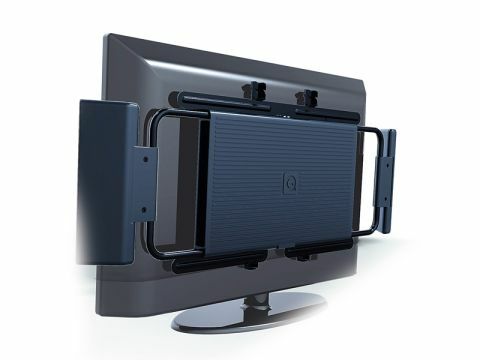 A 2.1-channel speaker enhancement system for flatscreen TVs, Q Acoustics' Q-TV2 bolts to the back of the telly, and consists of a vibration-cancelled subwoofer with a downward-firing port, two side speakers which can be angled to hug the sides of the TV, and a built-in amplification system. Once assembled the whole rig should be practically invisible. Fitting is achieved using VESA standard mounting brackets and spacers. This model fits on sets from 30-42in, but versions for larger and smaller screens should be on the way. Connection is via a line output, headphone output or optical digital output, so depending on the connection type, some sets will let you mute their internal speaker and control the Q-TV2 volume with the TV remote; if not you control the Q-TV2 volume with its own handset. There's also a socket for input from an iPod or similar device; you don't have to have the TV switched on to use this. Sound improvement is immediate and obvious, adding 50W of bass in the 50Hz-180Hz range and 25W from the four 1in 180Hz-20kHz BMR (Balanced Mode Radiator) side drivers. Once fitted the system does appear practically invisible and essentially becomes a part of your flatscreen. The overall sound is rather brash and bright, and other than a bass curve adjustment, there's no tone control. Could be a bit of a hard sell to someone who has already spent £600 or more on a TV.